The year of 1968 brought with it the debut of the Corvette T-Top. A standard option that became so popular it forced its lowly brother the convertible into retirement on all Corvettes between 1976 and 1986. 14 years of production however provided us with many variances consisting of; painted t-tops, glass t-tops, different types of glass, single latch, double latch, among other minor differences. The purpose of this document is to offer some clarity and answers to the many questions we receive regarding 68-82 Corvette T-Tops. 1978-1982- All vehicles came standard with painted fiberglass panels. 1978 saw only 972 sales (excluding Pace Car option) of the CC1 glass option but sales boomed during following years (see chart below). Glass- To date there have been 6 different glass types available from LOF and PPG for the 78-82 Corvette. 5 of those 6 were all loosely called mirrored tops yet no one glass will match the other. This created much confusion for the Corvette owner looking for a replacement T-Top. 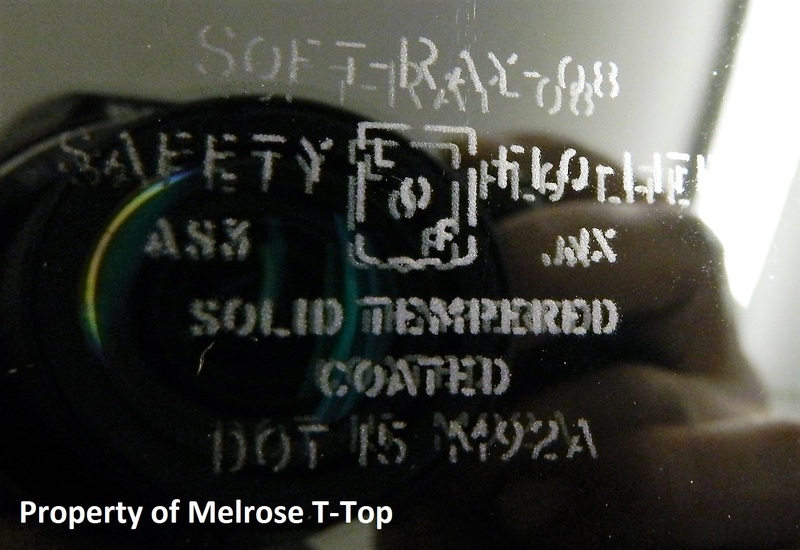 For those who can’t differentiate the types by simply looking at the glass you must then turn to the “M” code. 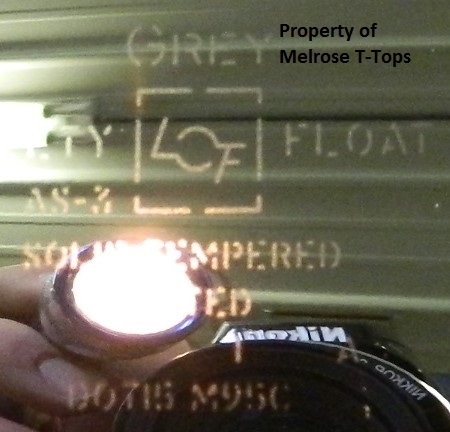 The “M” code or “Manufacturers Code” is located within the etched in stamp on the outside rear corner of the glass. 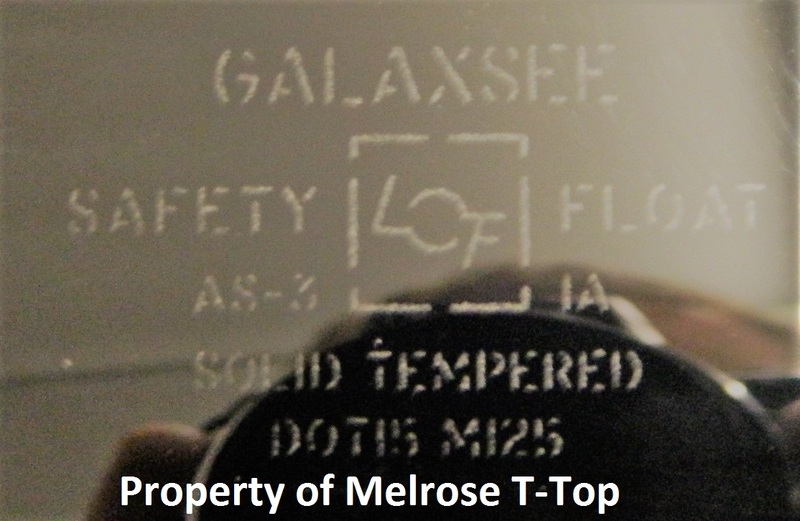 M1131- We receive many calls from Corvette owners seeking out M1131 coded glass tops, also known as, “blues” and “pace car tops”. These mirrored laminated tops were manufactured like a windshield with a plastic film sandwiched between two thinner sheets of glass. 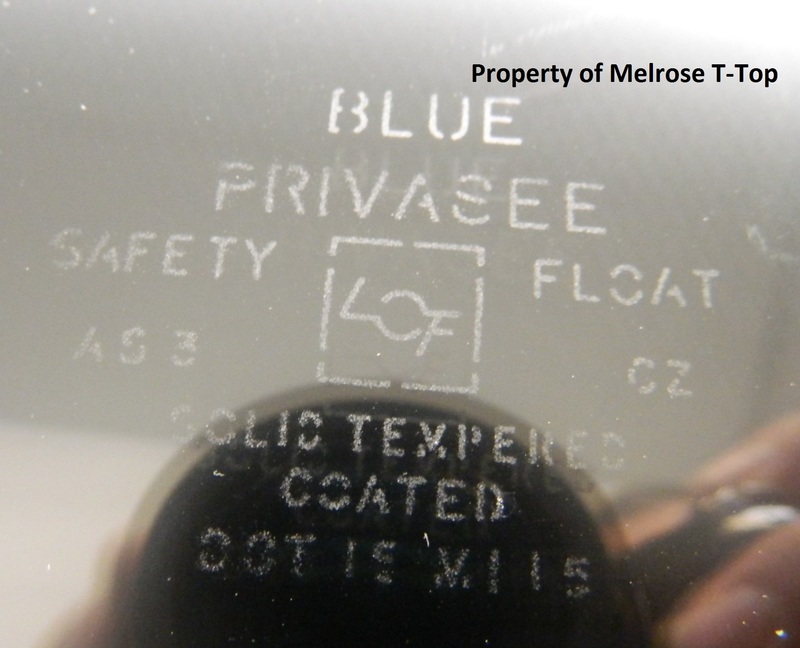 The plastic film was tinted blue and not the glass, as most people assume. There were two drawbacks to this style of laminated glass. 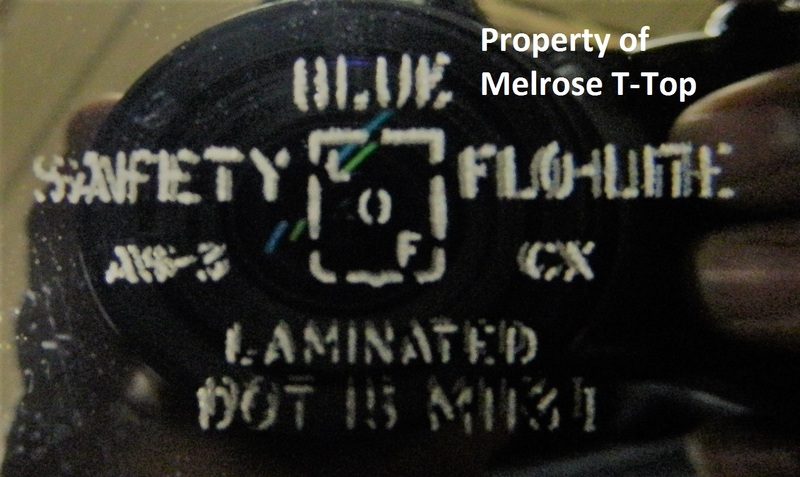 First, the film faded with age and UV exposure turning the deep blue film into various shades of green and in worst cases brown, making the tops difficult to match in later years. 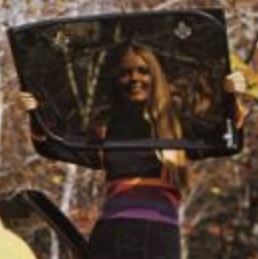 Second, they were extremely fragile, which is the main reason GM switched to tempered glass in later years. If you are searching for these tops I suggest you first and foremost decide if you want to deal with the care involved. A mint set can run upwards of $3,000 with driver’s sides being the more valuable of the two. Compile that price tag with the constant fear of these tops breaking and Corvette ownership becomes a thing of stress instead of fun. M92A- Tempered Mirrored glass that replaced the M1131 blues. Due to the greater strength of tempered glass these tops are more prevalent in today’s market place than the M1131’s. These are less mirrored appearing from the outside than the blues since the mirrored finish was on the inside of the glass. M94A- Often referred to as collector tops because they were only offered on the 1982 Collector edition cars. They have a unique bronz(ish) finish to them. Replacements are hard to locate. The glass in the above three photos are all the same even though the logos and codes are different. This the only glass that can be mixed and matched with no noticeable differences save for the etched in logos. The glass was originally formed by PPG then contracted to LOF where it is still currently made. It is mirrored and tempered and replaced the M1131 blues by the thousands as the blues continued to crack over the years. Currently available. M125- Galaxsee ™ glass - Dark smoked glass formed by LOF. Also known as “black glass”. Can also be seen as the dark privacy glass on many of the newer GM SUV’s and trucks. 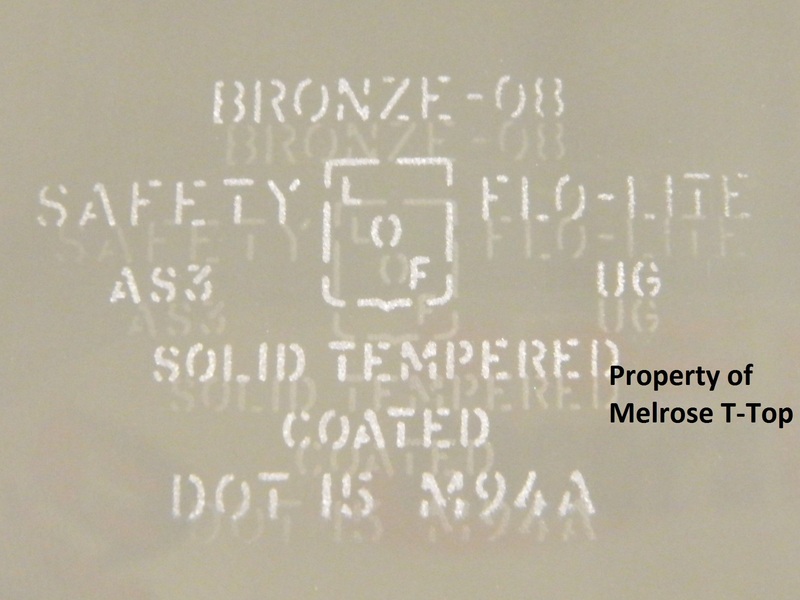 This glass boasts claims of blocking 95% of UV light according to Pilkington glass website. 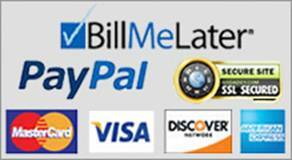 Currently Available. M115- This was a short run glass produced by LOF. Don’t be fooled by the word “BLUE” these will not match the m1131 laminated blues and they are not as valuable. Moonroofs- These tops were a hybrid top with a fiberglass perimeter and glass center. 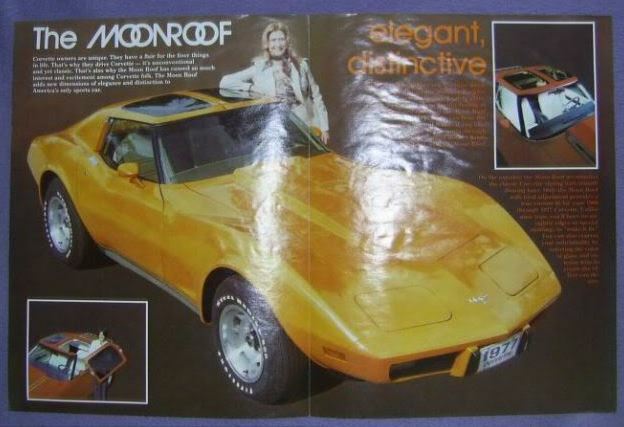 Moonroof had a contract with GM in 1977 that eventually fell through due to rights and licensing disagreements. 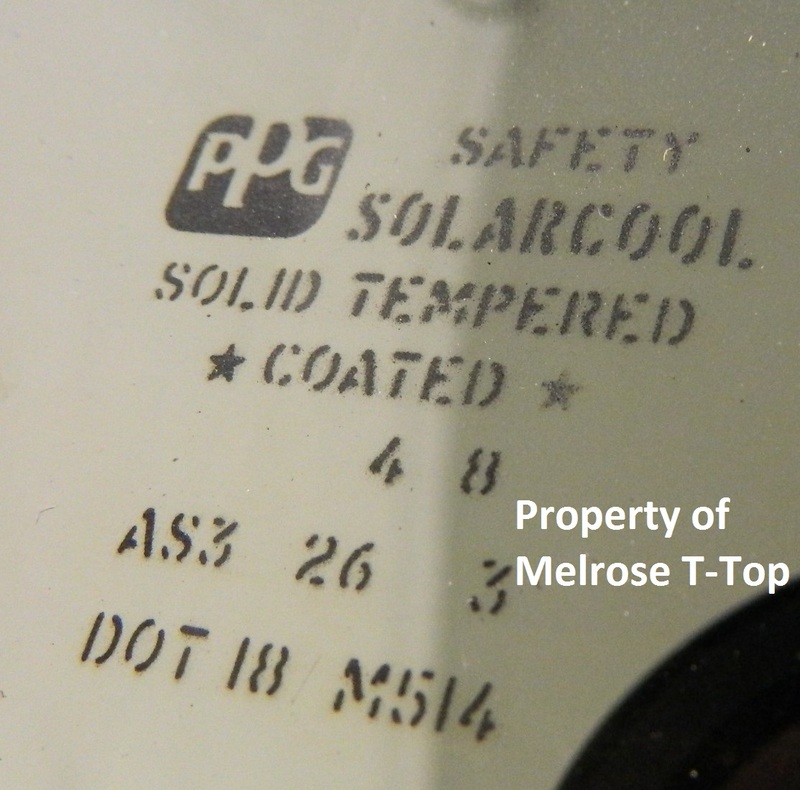 Moonroof went on in 1978 to sell the t-tops independently in the aftermarket. 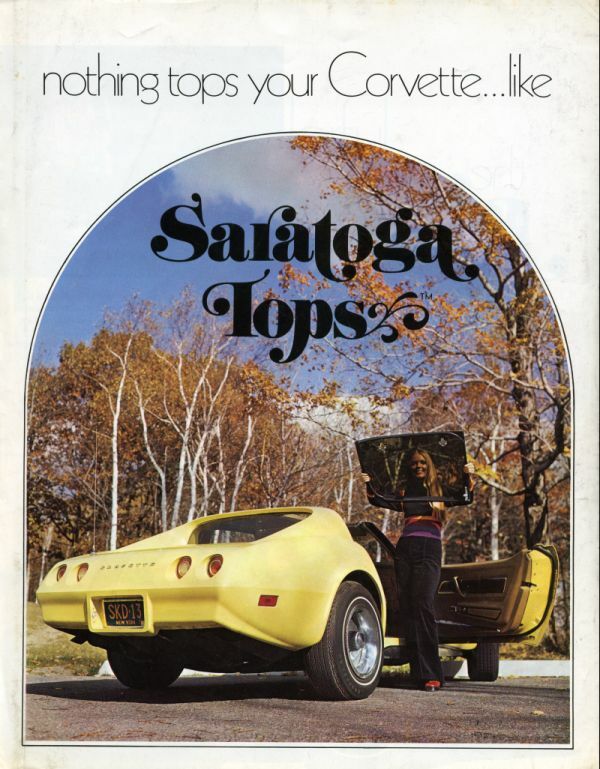 Saratoga tops- Like Moonroof, Saratoga saw a market opportunity to sell the Corvette owner transparent t-tops. Unlike Moonroof however, Saratoga had no desire to deal with GM and went direct to market. The first design in '77 and '78 was a simple design with no inner structural frame. These retailed for around $200. Beginning in '79 Saratoga debuted a new design that sported a fiberglass frame bonded to a polycarbonate lens. These were much more attractive to the end user but came at a price that was three times the cost of the first design. Saratoga continued to sell t-tops into the early 90's. 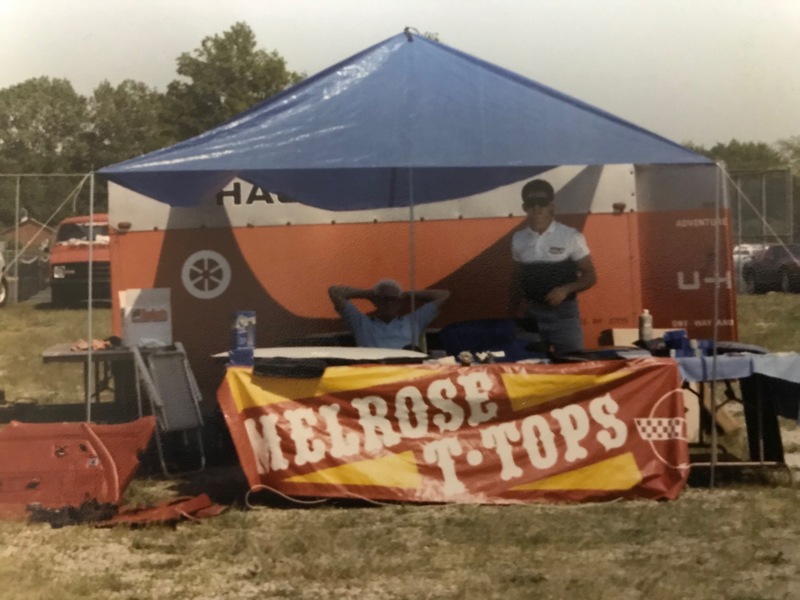 We at Melrose began producing aftermarket acrylic t-tops in 1983 under the roof of a 4 car body shop in Melrose Park, IL. Consumers ate up the fun see through blue and red colors, but it was the everyday smoked panels that were sold by the hundreds, ultimately fueling the growth for expansion and licensing agreements with General Motors. 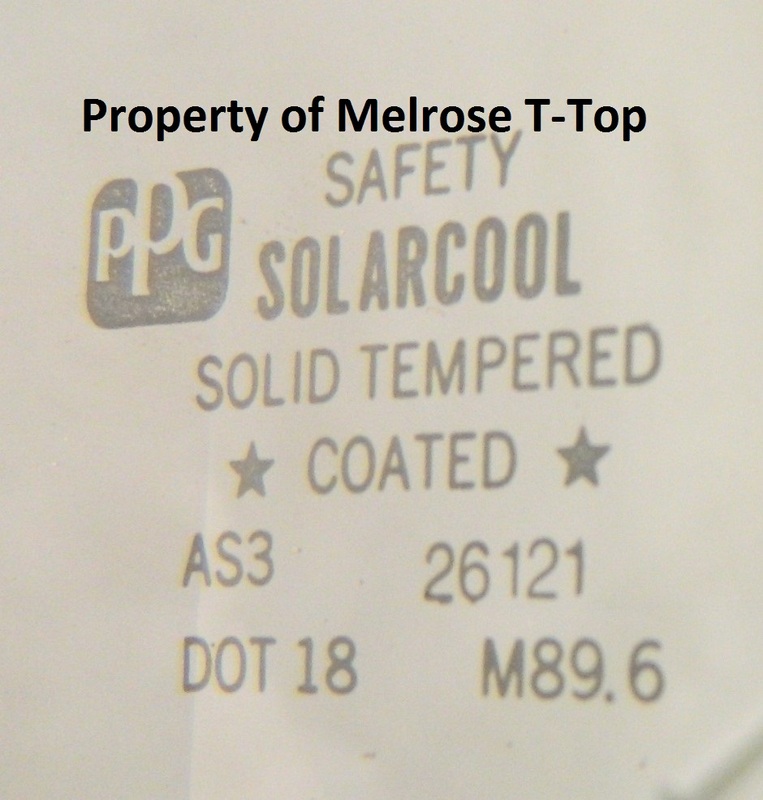 Many relocations and 35 plus years later, Melrose T-Top now supplies GM licensed T-Tops and roofs for 5 generations of Corvettes.